This reviewer has been compensated in the form of a Best Buy Gift Card and/or received the product/service at a reduced price or for free. When you are striving to live a healthy lifestyle, sometimes it is hard to keep track of your progress. If you are dieting, you may want to keep a food log, keep track of your calories and possibly keep track of meeting you attend. When you are exercising, there are so many different things you probably should track including your choice of activity and it’s levels, time spent, calories or fat burned, weight lost and more. Where should you keep all this information logged for your reference? You could write it down but that is time consuming and often times people forget to jot it down or lose their notebook or journal. 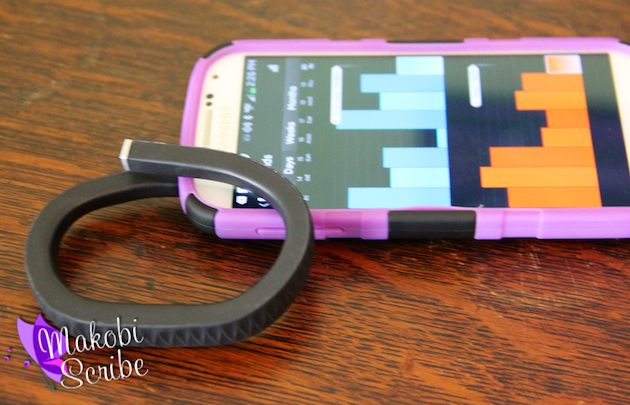 To track your fitness goals easily, many people are purchasing the Up from Jawbone at Best Buy. Live Better. Start Now. Jawbone UP. Track your sleep activity, steps, calorie intake and more with the Jawbone UP wrist sensor and free mobile app. UP gives you meaningful, personalized insights so you can make lasting improvements to your everyday life. UP is a system that takes a holistic approach to a healthy lifestyle. The wristband tracks your movement, notifies you when you have been idle too long and sleep in the background, helping you track your fitness goals easily. The app displays your data, lets you add things like meals and mood, and delivers insights that keep you moving forward. The Up measures distance, calories burned and the amount and the intensity of your workout. It monitors the number of hours and how deeply you sleep as well as your waking hours to help you see those habits to you can modify them when necessary. The smart alarm gently wakes you with its vibration at the ideal time of your sleep cycle, which enables you to stay rested throughout the day. The Up also provides an intuitive journal in which you can take pictures of food and can answer questions about how they makes you feel. The Up connects to your computer easily as well as your syncs with your smartphone as well as iOS and Android apps. The Up itself has a 10 day battery life, is water resistant, lightweight, comes in a variety of colors and fits in easily as an attractive accessory to your wardrobe. You can purchase your Up by Jawbone from Best Buy for $129.99, with free shipping.